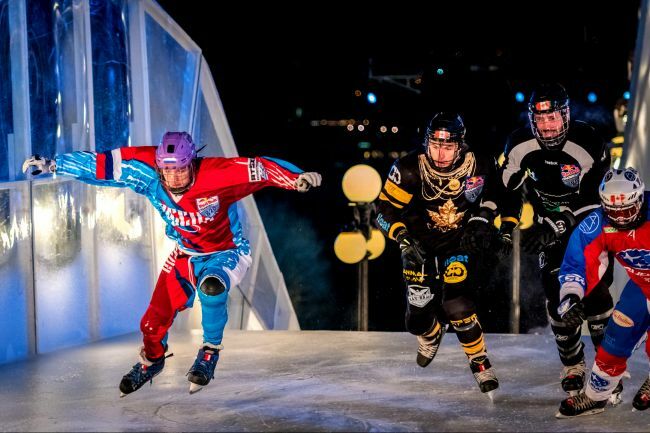 You’ve got to love party swag that’s not only practical but essential, such as the grey tuques handed out to some 1,400 ticket holders for the Red Bull Crashed Ice VIP party held at the Château Laurier on Saturday night. It was definitely hat weather for watching the winter extreme sport from the best view in town: right next to the ice track, on the terrace of the historic hotel, which, thanks to some beautiful lighting, resembled Disney’s Magic Kingdom castle. The Château Laurier, which was booked solid over the weekend, was the place to be. That’s judging by its bustling hotel lobby, corridors and restaurants. “Normally this time of year we’re not full, so this is really exciting,” said Deneen Perrin, the hotel’s director of public relations. Inside, multiple food and drink stations were set up in the Laurier Room and Ballroom, with lounge areas, music and giant screens for the less winter-hardy to watch the competition from indoors. The VIP event was sold out, at $290 a ticket. It was a momentous weekend for Guy Laflamme, executive director of the Ottawa 2017 Bureau. 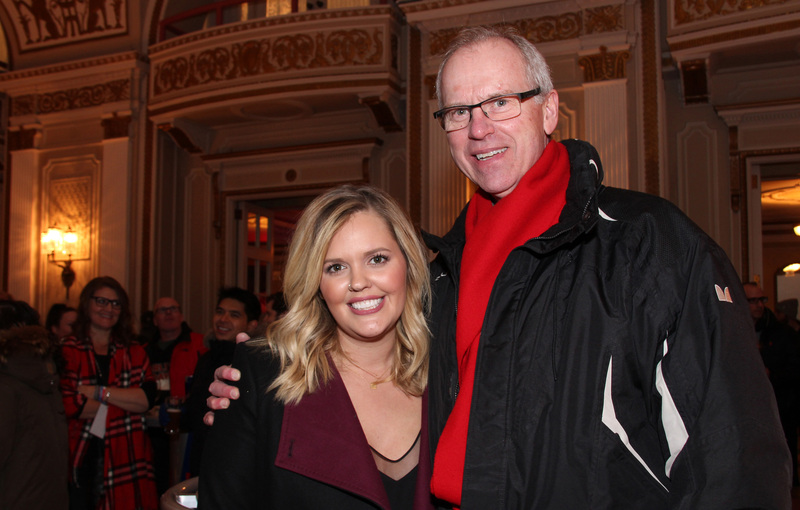 It was his vision to bring Crashed Ice to the nation’s capital as part of the Canada’s 150th anniversary celebrations. The elaborate track was built between the Château Laurier and Parliament Hill, descending the Rideau Canal lift locks. Mayor Jim Watson admits to responding with doubt when Laflamme first pitched the idea. “I said ‘How’s that going to fit?,’” recalled a parka-wearing Watson on the balcony, just metres away from the track’s starting line. The exceptional views weren’t lost on Mirko Bibic, executive vice-president with major sponsor Bell. 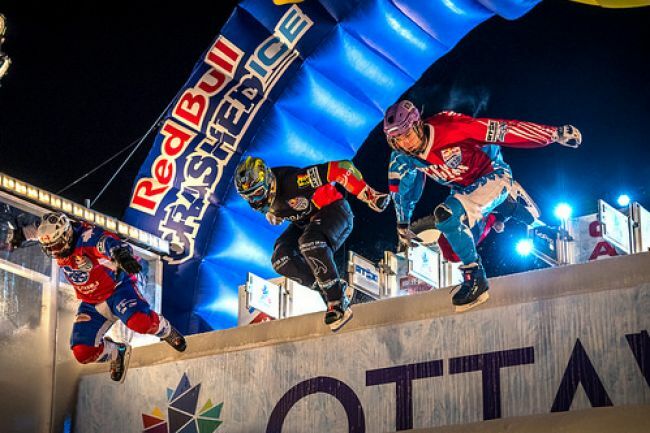 “It’s phenomenal scenery,” remarked Bibic, who fully expects the televised coverage of Red Bull Crashed Ice to entice viewers to visit Ottawa. Spotted at the VIP event were many from CIBC, the lead sponsor of Ottawa 2017; OSEG president Bernie Ashe and Shopify vice-president Brittany Forsyth, both of whom sit on the Ottawa 2017 board; cannabis entrepreneur Bruce Linton, chief executive of Canopy Growth Corp.; Ottawa 2017 co-chairs and councillors Jean Cloutier and Mathieu Fleury, Ottawa MPP John Fraser and retired Senators player Chris Phillips sporting both his new Red Bull Crashed Ice tuque and CIBC wool scarf.